I have a lot of ideas, I love to write, and I take pictures wherever I go. Living on an isthmus between Lake Mendota and Lake Monona, I follow my inspirations to create, connect, celebrate and explore. Why did I start this project? Sometimes I do wonder at my sanity for having put myself out in the public like this. The modern habit of blogging isn't always comfortable to me. I admit, I started this blog project when I was confused. I was finally sleeping through the night again after having 2 kids in less than 2 years. My brain woke back up and wondered, how does it all fit together? A powerful voice suggested that writing a blog helps a person figure things out, especially with regards to work and a vision for life. This project has done that for me. So I keep going. It continues to evolve and provide me a space to try new things. -As a parent, I am exploring the place where we as a family are making our home. -As a writer, photographer, and artist, I am playing with ideas, documenting my projects, and following my vision for creatively living in this place. -As a humanist and community outreach professional, I am poking around the issues affecting my neighborhood to raise questions, give my opinion, and push us all to be more thoughtful. -As a yogi, I am finding inspiration and joy in this world and sometimes, perhaps, inspiring others to do the same. That is me in the beard. My husband and I are riding a bike dubbed the 'push-me-pull-me' bike in what was an annual Art Bike Parade. 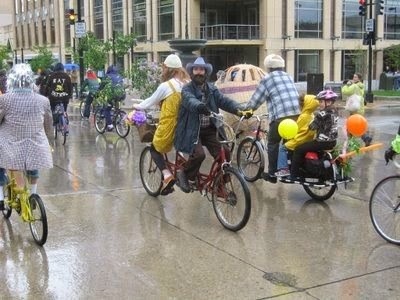 For a couple years, I coordinated the parade, which kicked off Bike To Work Week for the Wisconsin Bicycle Federation. My parents are educated people, writers and thinkers, and I grew up without a lot of money but with the privilege of lots of world travel. We lived in Germany for the first time when I was six years old and returned to Europe many times before spending a year of high school in Germany and a year of college in France. Today, the things I love about urban living come, at least in part, from those experiences: bike commuting, fresh ingredients from the market, train travel, and vibrant urban spaces designed at a human scale. I have a Masters in Museum Education, which means I'm trained to be the interpreter. In other words, to explain and connect people with ideas and things and places. I graduated from an arts high school (kinda like Fame...) and am always making things (sewing, building furniture, taking pictures, writing stories). I have way more ideas than I can realize and I like making things happen, so I try many of the ideas out, at least once. Since 2001, I've worked for a really cool non-profit where I've gotten to coordinate Smithsonian exhibition tours around the state, design book discussions about things like war and immigration, organize film festivals, facilitate group discussions about civics based on ideas from classic literature, and plan Wisconsin Book Festival events with amazing authors. Now I am the editor of the online magazine and in charge of digital communications. In other words, my hobby blog + community organizing and my work life are not that different. I like it here. I have traveled to a lot of places, and lived in a number of places, and I like Madison. But I do feel critical sometimes. From where I stand, I don't understand why, with all this place has going for it, we are not demanding to be a model for the world? Why not be an example of how to do 'mid-size urban' in the 21st century in a way that is good for people, for kids, for the air and water and for our brains and bodies? Why not go crazy and make Madison a super happy place?